Flower Power Classic Slot Guide & Review - Casino Answers! 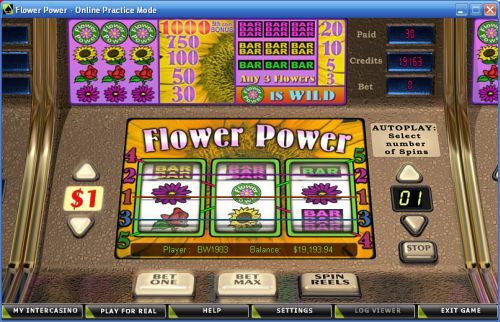 Flower Power is a 3-reel, 5-line classic slot machine, featuring a wild symbol. You can play the Flower Power classic slot machine at [Americans: Unfortunately due to legal restrictions you are unable to play at any of the online casinos this game is at. We recommend you trying playing the unique slots at Win A Day Casino instead.]. The highest paying symbol on the Flower Power multi-line slot machine is the Flower Power symbol. If you 3 Flower Power symbols land on a selected payline, you will win the 1000 coin top jackpot. When not playing all 5 coins, the Flower Power symbol will pay out 750 coins. The Flower Power symbol is wild and will substitute for all other symbols in the game. You can win this top jackpot when you play at [Americans: Unfortunately due to legal restrictions you are unable to play at any of the online casinos this game is at. We recommend you trying playing the unique slots at Win A Day Casino instead.]. There are 8 winning combinations on the Flower Power classic slot machine. The complete payout schedule is as follows (payouts in parenthesis): any 3 Flower symbols (3), 3 Single Bar symbols (5), 3 Double Bar symbols (10), 3 Triple Bar symbols (20), 3 Daisy symbols (30), 3 Rose symbols (50), 3 Sunflower symbols (100), 3 Flower Power symbols (750) and 3 Flower Power symbols on a maximum bet (1000 coins). Flower Power is a below average classic slot game. There is nothing special to it, it lacks in presentation and the top payout is nothing special. You can play the Flower Power slot game when you sign up and make a deposit at [Americans: Unfortunately due to legal restrictions you are unable to play at any of the online casinos this game is at. We recommend you trying playing the unique slots at Win A Day Casino instead.]. Can USA players play the Flower Power online slot machine? No, American players cannot play the Flower Power slot machine for real money. For a great selection of slot machines that are USA-friendly, you can play at Bovada.